PUBLISH YOUR BOOK WITH A TRUSTED NAME. Founded by Donna Erickson and now owned by Ruth E. Thaler-Carter and Charles Davis, A Flair For Writing has provided the highest quality in writing and editing services to independent authors and other clients for more than two decades. We expanded to offer full publishing and print-on-demand (POD) services in response to the need for a credible, reliable, and trustworthy name in the area of independent publishing. Since establishing our publishing division, we have been working with authors from around the world to help them fulfill their publishing dreams. Our model is unlike most others. We are not a vanity press and are highly selective in our approval process for submissions. We care about our authors and their books, and are dedicated to making each project the best it can be. Before you attempt to publish your book, please read ours. and you’ll be on your way. 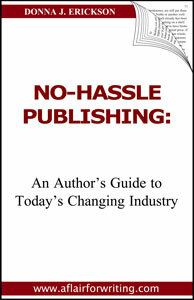 In this short booklet of nine condensed, easy-to-read chapters, you’ll quickly learn how to succeed in your publishing journey. Our mission is based on our sound business ethics. We want to differentiate ourselves from the many unscrupulous publishing companies doing business today and offer our authors a better option. Please make sure your manuscript is in 12 pt. Times Roman font, double-spaced, with a one-inch margin all around. For children's books, please email the entire manuscript. Your manuscript sample will be reviewed to determine if it is acceptable. You will receive a reply within two weeks. Once we’ve accepted your manuscript, we’ve made the rest easy for you. Unlike our competitors, we do not offer high-priced, complex publishing packages full of services you may not want or need. THEN … YOU select the services YOU want to create your own package. Simply let us know the quantity of books to print, and we will quote you a complete price. We require editing and book layout design to meet our quality standards before your manuscript goes to print. We will determine what level of editing and formatting your project requires. These costs will be added to your base price. You will be referred to a highly skilled professional Illustrator, who will design your book’s cover and any inside illustrations. These fees are separate and will be paid by you directly to the Illustrator. You will receive a price quote for high-quality, digital printing and Perfect Binding of your book, based on the number of manuscript pages. The cost will be added to your base price. If you choose to have us write a Press Release, you can select this service for an additional fee. Press Releases will be distributed to up to two of your hometown newspapers, within the U.S. If you require further PR or marketing services for online distribution, we will refer you to one of our talented affiliates. If you choose to add a professional video, our in-house Videographer will create a custom-made product to promote your book on your website, blog, social networking sites, YouTube.com, cable television, etc. You will pay this fee directly to the Videographer. All Editing Services include a review by the Editor of three (3) manuscript chapters to determine the appropriate Editing rate. The Author must accept Editor’s recommendation. Cost for Editing Services is based on the number of Manuscript Pages and the level of editing required. One round of Author Edits is included in the Editing Prices. Further rounds of Author Edits will be an additional charge at the rate of $75.00 per hour. Includes proofing for punctuation, grammar, spelling, and overall word flow. Author has done the major editing but is hiring a “second pair of eyes” to go through the manuscript. In addition to the Basic Editing Services, these manuscripts also require changes/corrections in sentence structure, tenses, voices, accuracy of facts, etc. All Basic and Extensive Editing with the addition of rewriting text for clarity, changing position of text, changing POV (point of view) for characters, changing first person/third person narrator thought, speech, and/or dialogue, correcting author intrusion, re-creating beginning/ending of chapters, and/or changing character description/conflict/development. Cost for Formatting Manuscript Pages is based on the number of pages and the extent of formatting required. Publisher requires that your book be formatted. For basic, text only, fiction novels that only require simple formatting. • Email consultation • Select from a list of our standard fonts. • Choose formatting options such as font size, line spacing, chapter title alignment, page number placement and chapter heads. • Receive a PDF draft of the book for review and approval. • Once approved, a print-ready PDF of the finished book will be delivered via email. Quick Turnaround! Basic jobs do not need to be scheduled and will be completed within two weeks (often earlier) from the time you submit your order and send in your documents. A step up from the Basic that includes phone consultation, more font choices and the creation of a sample chapter layout for your review. • Email and phone consultation • Select from a list of our available fonts. • Choose formatting options yourself or have formatter select for you. • Sample chapter layout created for your review and approval before book is formatted. • Receive a PDF draft of the book for review and approval. • Once approved, a print-ready PDF of the finished book will be delivered via email. Completed within one to two weeks from the time your job is scheduled to begin. For books that require a more advanced layout including any book with images, block quotes, footnotes, lists, tables, etc. • Email and phone consultation • Select from a list of our available fonts. • Allows for images, tables, lists, footnotes, block quotes, etc. • Choose formatting options yourself or have formatter select for you. • Sample chapter layout created for your review and approval before book is formatted. • Receive a PDF draft of the book for review and approval. • Once approved, a print-ready PDF of the finished book will be delivered via email. Completed within two weeks from the time your job is scheduled to begin. Whatever you publish, you rightfully own. However, registering the copyright of your work prevents others from extracting, plagiarizing, or copying your book’s contents. You have the option to register the copyright with the U.S. Copyright Office. To do this, you must (a) submit an application with the fee of $35–$45 and (b) send your manuscript file either electronically or by U.S. Mail to the U.S. Copyright Office. To register, go to: http://www.copyright.gov/register/literary.html. If you plan to sell your book to Libraries, you will need a Pre-Assigned Card Catalog Number (PCN). Books must be more than 50 pages. We will obtain the number for you, upon request. This is similar to a UPC code on other merchandise. We will obtain an ISBN for you because the Publisher owns the number. The 13-digit number will be printed on the Copyright Page and the bar code on the back cover of the book. Let us know if you plan to distribute your book in the U.S., Canada, or globally. Cost is based on the number of Manuscript Pages after formatting and includes full-color printing of book cover and Perfect Binding. All inside pages are printed on 50 lb. crème or white stock with black ink. Any inside pages requiring ink color other than black will be quoted at an additional cost. One (1) Press Proof will be shipped to Author for approval before the full run of books is printed. Any changes made, other than typographical errors, will be charged to the Author at an additional cost. Publisher will quote a cost for 8, 12, or 25 books, as well as additional books for larger print runs. Shipping of the entire Book Order will be at the expense of the Author and will be billed separately. Publisher will write a Press Release for the Author and will distribute it to one (1) of the Author’s U.S. hometown newspapers. Publisher will prepare a Press Release and Bio of the Author and will distribute it to two (2) of the Author’s U.S. hometown newspapers. $50 and up per double-spaced page. Price quote available upon request.